It’s a quiet evening at home. Two and a Half Men has been recycling ad nauseam and there’s 30 minutes left until Extreme Couponing is on. Your significant other is in the other room glued to an Xbox controller and yelling something about the cake being a lie. If this sounds like a typical Sunday night in your home, it’s time to get out and check out Burgundy Brixx and the other players in the weekly Kitty Nights Burlesque Show at the Biltmore Cabaret. I had the pleasure of popping my burlesque cherry this past Sunday, in anticipation of Vancouver’s International Burlesque Festival this coming weekend (May 5 – 7). What surprised me the most was the diversity of the large crowd that turned up at the Biltmore after 9 on a Sunday night. Though the room was definitely in keeping with the alternative lifestyle crew that frequents anywhere BUT Starbucks on Main, there were a plethora of couples, trendy business guys, and groups of girls out on the town. The evening started off with an introduction from burlesque royalty, Burgundy Brixx and her co-host The Purrrfessor, accompanied by DJ Teddy Smooth. Burgundy took the stage first with a performance from the Queen Mother herself, which sparked a jubilant response from the crowd, playing off the Royal Wedding vibe. The show featured three performers; Burgundy Brixx, Voracious V, and Cara Milk, each performing two numbers as a preview for their upcoming performances at the burlesque festival. During the intermission, burlesquer Nicky Ninedoors performed a fabulous go-go dance in which she artfully wielded dual hula-hoops while wearing heels, and subsequently obtained more tips in 15 minutes than I make in a weekend as a server. Perhaps I should consider a change in profession? The show also featured the first performance ever by “Boy-lesque” entertainer Knee Slider, whom I’m told also has a place in the upcoming festival. He managed to incorporate silly string and a wood-chipper prop of sorts into what can only be described as the Charlie Sheen portion of the show. 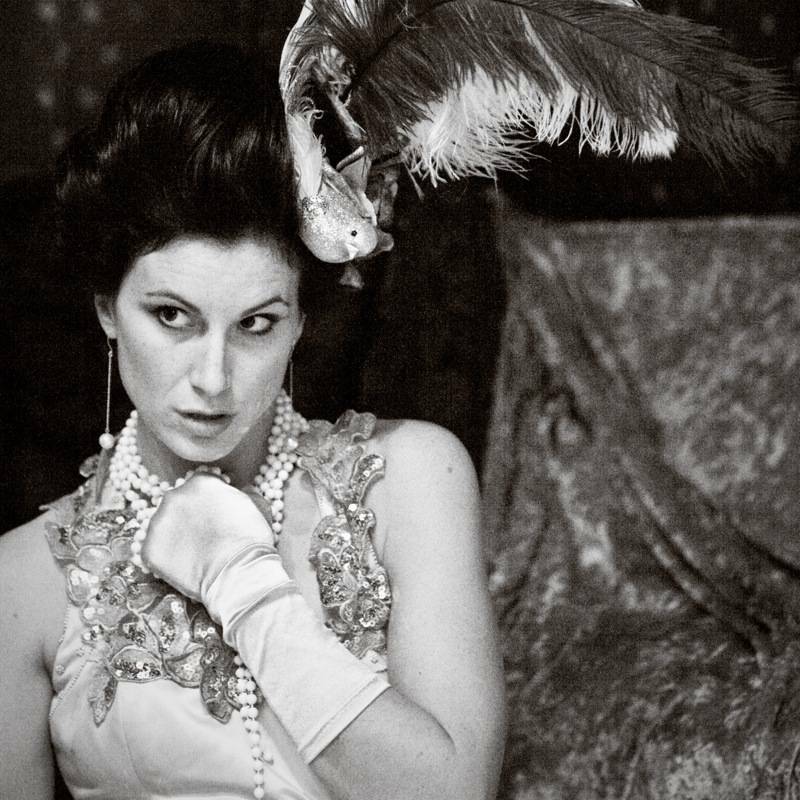 I got the chance to speak with the lovely Cara Milk, fashion designer and dancer, as well as with Burgundy herself about the burlesque medium. Having never attended a show before, I asked both women to give a piece of advice to a burlesque-virgin. “We are flattery based,” says Milk. “Don’t be afraid to hoot and holler! 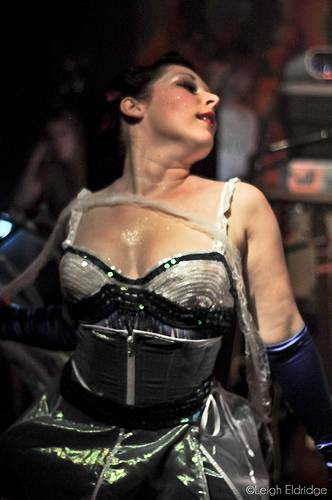 Burlesque is meant to be interactive with the audience,” adds Brixx. Famous burlesque dancer Gypsy Rose Lee puts it this way: “If you want her to be awed – just whistle and applaud, ’cause that’s when the lady is a broad!” This was certainly true of what I witnessed on Sunday. The louder the crowd, the more into it the girls were, and the more fun that was had by all. Don’t miss Burgundy Brixx, Cara Milk, Voracious V, Nicky Ninedoors, and a special group performance by the Kitty Nights participants at the International Burlesque Festival this weekend at the Rickshaw and Vogue theatres. This entry was posted in events and tagged Biltmore Cabaret, Burgundy Brixx, Cara Milk, Nicky Ninedoors, Vancouver burlesque. Bookmark the permalink.